April 7, 2017: Start and end times for closure has been updated for weekend of April 8. March 30, 2017: Start and end times for closure has been updated for weekend of April 1. March 23, 2017: Updated local access map. March 10, 2017: Full closure of Flower St continues weekend of March 10. March 3, 2017: Full closure of Flower St continues, beginning weekend of March 3. February 24, 2017: Full closure of Flower St to be replaced by lane reduction on weekend of February 24–27 only. February 3, 2017: Traffic detour updated to accommodate filming permit along Grand Ave. for weekend of February 3–6 only. January 26, 2017: Weekend closures along Flower St are now back in effect, starting Friday, January 27. 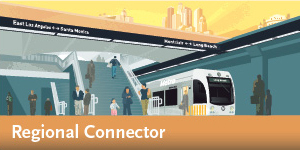 Regional Connector Constructors (RCC) will continue cut and cover activities on Flower St. between 4th St. and 5th St. This activity requires thru traffic be restricted on Flower St. from 3rd St. to 5th St.
Work will begin at 5 am on Saturday, April 8, 2017 and will remain in place through 2 am on Sunday, April 9, 2017. The following activities will take place during the closure: saw cutting, roadway removal, beam installation, protection of utilities and temporary deck panels will be installed. Traffic will be maintained through Lower 4th St. from Figueroa St. to Flower St. Local access to businesses will be maintained during the closure. Pedestrian access will be maintained outside the construction area. Flaggers will be onsite to facilitate access. Please follow the posted detour signs. Left turn onto southbound Flower St. will be maintained. Lane reductions on westbound 5th St. between Grand Ave. and Flower St.
Access to all driveways will be maintained. Access to World Trade Center parking garage use 3rd St.
Access to J2 North/South, Citigroup Center, and Bonaventure Hotel parking use lower 4th St.
Detours: The primary detour will route traffic from Hope St. to Grand Ave. via 1st St. then back to Flower St. via 5th St.